This calculator estimates the temperature felt by the body as a result of wind speed and actual measured temperature. 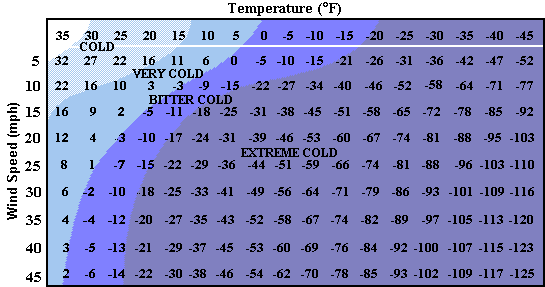 The perceived temperature due to wind chill is lower than the actual air temperature for all temperature values where the formula used is valid (-50°F to 50°F). This is similar to the body feeling a higher temperature under high humidity conditions in the summer. Refer to the Heat Index Calculator for further detail. The formula to estimate the Wind Chill Temperature Index was provided by the National Weather Service. We give out results for both. where T is the actual air temperature in fahrenheit, V is the wind speed in mph. A surface, such as the skin on a person's body, loses heat through conduction, convection, and radiation. Although conduction and radiation are relevant to heat transfer, wind chill temperature is mostly a result of convection. Convection is defined as heat transfer due to the bulk movement of molecules within fluids such as gases and liquids, such as wind. Essentially, as air around a body moves, it disrupts the warm air surrounding the body, allowing cooler air to replace the warm air. The faster the wind speed, and thus the movement of the surrounding air, the faster the surface cools. 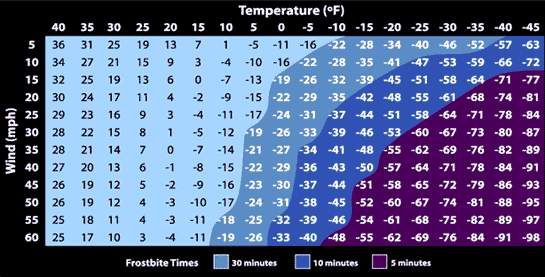 The result of wind chill is to increase the rate at which heat loss occurs. The physiological response of the body to an increased rate of heat loss is to generate more heat to maintain surface temperature, resulting in the perception of lower temperatures due to greater heat loss. This perception of lower temperatures led to the development of many different formulas that attempt to qualitatively predict the effect of wind on this perceived temperature. Because wind chill temperature is not an exact science, weather services in different countries use standards relevant to their particular region. This calculator uses the formula developed by the National Weather Service in the United States, and thus its estimates may differ from those provided by local weather services in other regions.